"This might be the year's prettiest Christmas album, and it might be the best." So says The New York Times about "My Holiday," a new CD from Mindy Smith. She joins us on the Second Cup Cafe stage to sing songs from her new album. The album evokes a sense of nostalgia, simple joy and togetherness with a collection of eleven gentle, acoustic-driven originals and standards. "With this record, I'm not trying to put out too much of a message of any kind, other than Christmas is fun and to appreciate the things that you have," the singer-songwriter said. "I think Christmas is about expressing gratitude to people and saying, 'I'm thankful that you're in my life.'" 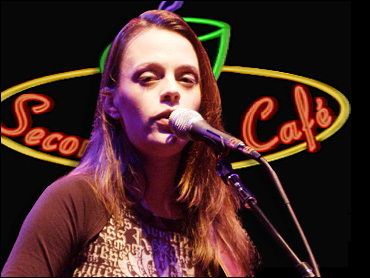 Smith's previous, highly-acclaimed albums - "One Moment More" (2004) and "Long Island Shores" (2006) - showcased her delicate voice and winsome songwriting skills. "When you sit down to write a Christmas song," Smith said of her new album, "you have to think about how you feel at Christmas, and what about the holiday season moves you. It's a different thought process than just writing a song about life in general. "And I think there are certain note selections and chord progressions that can make a new Christmas song familiar. I think that happened with the songwriting process on this album, in that there were a lot of familiar musical choices. It wasn't intentional. It's just where I naturally went to with these notes and words. Then bringing something a little new to the table. I think all of those elements come together in a Christmas song." She also brings her own open-eyed take to a handful of seasonal standards, rendering chestnuts like "Silver Bells," "I'll Be Home For Christmas," "What Are You Doing New Year's Eve?" and "The Christmas Song" with an understated charm that makes them glisten anew. "I hope people find it fun to listen to," Smith reflected. "It sure was fun to make."